Property assessment is in, and up! I'm no expert on property taxes, but we received the latest municipal property assessment recently, and I suppose it's a mixed blessing. It's nice, in theory, that the value of our property is up: if we ever sell, that'll be good. On the other hand, who likes to pay more tax? So, I plugged the numbers from the latest assessment into the interweb and came up with the following graph. I don't find it especially informative, but it's nice to look at. Of course, we could appeal the assessment, but that could backfire. I doubt the assessment assessors assessed our assessment based on a genuine inspection of our particular property. We've made some serious improvements to the property, including replacing the roof, replacing the heat recovery ventilator, landscaping, and extensive cosmetic improvements. We suspect summoning the assessment re-assessment assessors to our home could reveal an even higher property value. That's the kind of news that'd be nice to hear from a real estate agent when it's time to sell, but not when it comes to setting how much municipal tax we'd pay. Any experienced homeowners with thoughts on the take-home message from all this? I suspect NS assessors follow the same process as they do here in Ontario. I would doubt that your improvements would have resulted in any significant change, even had they know about them. They categorize properties of a similar nature (detached 3 bd homes, etc,) along with "standard" property size, and neighbourhood, and then track the recent sale of properties to come up with a "market value assessment". The key is the change over time! Your recent purchase created a market value for that particular category of property--as did other similar sales in the area. They then plugged in a percent change into the data base, and all similar properties get nicked with the change (generally up). If big fancy homes increased more than semi-detached--then so goes the change for similar properties. Positive changes to cosmetics are unlikely to make a significant change in overall value--just make it that much easier to sell when a purchaser is looking. Same for a roof--all houses have a roof--vary in quality--but it is unlikely that a buyer will pay and extra $4K over a house down the street JUST because the roof is one year old--not 10. An option--pick out 3 houses on your block that appear to be like yours in size and function (perhaps even floor plan) and call the local municipal office, tax department, and ask for the assessed value of the 3 houses. IF they are all less than 3-4% of your assessment, there might be a reason to call the assessors and ask if they could give you any advice on why there is such a difference. Be cordial, ask to talk to the assessor for your geographic area, and say you are not filing a reassessment request (costs $$, and the onus is on you to prove you are correct at a quasi judicial hearing) --you are just seeking advice. If you are correct that there is something out of whack--they may just reduce your assessment (or perhaps raise the values of your 3 neighbours). Of course, any increase in value will very likely result in an increase in your property taxes--even if the council "keeps the same mil rate". Where I live, there is a state law that does not allow the county to profit from the reappraisal, and the reappraisal process is just a means of redistributing the tax load, but the county total collected is the same before and after the reappraisal. The actual tax rate is adjusted on a county wide basis to do this. 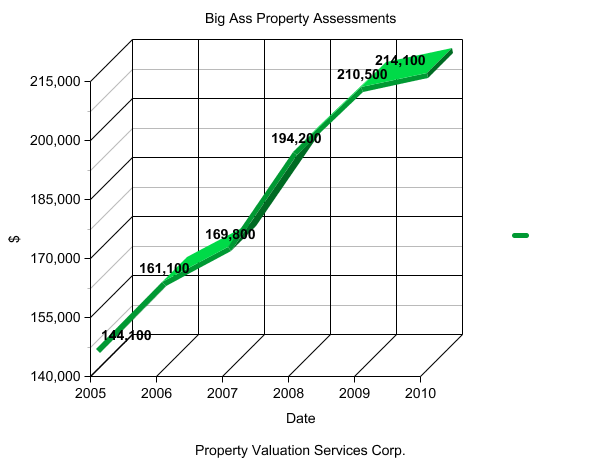 That way, if your appraisal didn't go up more than the county average, your actual tax bill would go down. If your appraisal increased exactly the average, your bill would be the same, and more than average would mean a larger bill. I have no idea how yours works, but do you know what your new actual tax bill will be? That is the important thing in all of it. Good luck.